100% Brand new and good quality drinking straws, made of sturdy stainless steel material, not easy to be damaged. Safe, non-toxic and reusable, it is a great choice for saving many plastic straws and disposable straws, helping reduce the pollution of environment. 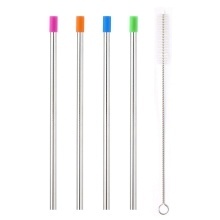 Total length of 9 inch, perfect metal straw for drinking cold bevarage, cappuccino, sipping cocktail, coffee, milkshake, ice tea, etc. Made of good quality stainless steel material, sturdy enough and not easy to be damaged. Fine workmanship, rust-proof, scratch-proof and resistant to corrosion. Eco-friendly and reusable design, helping save many plastic straws and disposable straws, and reducing the pollution of environment. Comes with removable soft silicone tip to help protect your lips and teeth, making it more comfortable to sip cold or hot drinks. Easy to clean with the included cleaning brush. The extra-long brush helps to clean the straw thoroughly, leaving no chance for bacteria to grow. Dishwasher safe.